What is the Government National Mortgage Association? 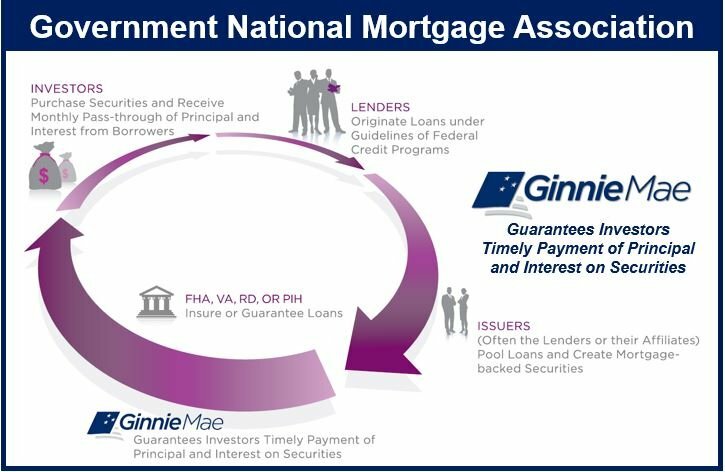 The Government National Mortgage Association, also known as Ginnie Mae and by its acronym GNMA, was set up in 1968 in the United States to promote home ownership across the country. GNMA is a government-owned corporation, part of the Department of Housing and Urban Development (HUD). It’s mission is to expand affordable housing finance in the United States by bringing domestic and global capital to the country’s housing finance markets, thus providing liquidity to federally-sponsored mortgage lending programs. Ginnie Mae claims to help make affordable housing a reality for millions of low- to moderate-income Americans. Its guarantee helps mortgagees (lenders) get a better price for their home loans in the secondary mortgage market. They can then use the proceeds to make new mortgages available. The corporation does not trade in loans or issue mortgage-backed securities (bonds backed by pools of mortgage loans). Therefore its balance sheet does not use derivatives or hedge to carry long-term debt. What it does is guarantee investors the prompt payment of principal and interest on mortgage-backed securities (MBS) supported by federally insured or guaranteed loans – mainly loans insured by the FHA (Federal Housing Administration), RD (Department of Agriculture’s Rural Development), and PIH (Office of Public and Indian Housing), or guaranteed by the VA (Department of Veterans Affairs). Ginnie Mae bonds are the only MBS in the United States that carry the full faith and credit guaranty of the federal government, which means that even during financial crises, they are one of the safest investments around. Unlike its cousins – Sallie Mae, Fannie Mae and Freddie Mac – Ginnie Mae is not a publicly-traded company.